Charlie Kaufman, creator of the ingenious labyrinthine worlds of Being John Malkovich (1999) and Eternal Sunshine of the Spotless Mind (2004), makes his directorial debut with his most maddeningly complicated film yet. It will not win him any more admirers; it will almost certainly lose him many. It will divide opinion into those who consider it the logical continuation of his previous work, and those who think he has completely lost the plot. I would love to declare it to be brilliant, but frankly I can’t be too sure its not a load of twaddle. Everything starts off reasonably simply. Caden Cotard is a hypochondriacal theatre director obsessed with death. Staging an unambitious production of Death of a Salesman, he casts a young man as Wille Loman, elucidating that it doesn’t matter whether he’s old or young – he will die anyway. Caden’s home life is beginning to fall apart: relations with his artist wife Adele have deteriorated to such an extent that she soon moves to Germany, taking their young daughter Olive with her. Cue much moping, leading to him finding solace with the theatre box-office assistant Hazel. So far, there have been some wonderfully deadpan Kaufman flourishes: curious word games and references to high literature; Caden envisioning himself in TV adverts, getting referred to a comical succession of medical specialists, and eventually end up seeing a therapst whose self-help books literally address him personally. Hazel lives in a house which is permanently on fire – a surprisingly successful metaphor for life itself. Indeed, black comedy which, for better or for worse, has come to be labelled ‘Kaufmanesque’. Things, though, begin to take a turn towards the bizarre when, on the back of his successful production of Salesman, Caden receives a MacArthur ‘genius grant’ which he can use to finance whatever artistic project he wishes. Increasingly obsessed with his own mortality, he decides to rent a Manhattan warehouse and attempt to recreate as nearly as possible life outside of it. In doing so, he believes, he will create art which is honest and real. The trouble is, his vision grows increasingly large, so large as being unable to accomodate an audience. Here is where things get rather muddled, intentionally so. Time, frequently a key motif in the film, begins to jump forward rapidly. Seeking out his wife and daughter in Germany, Caden is told that Olive is no longer four years old but ten; in film time this elipsis has taken only a few minutes. The world of his play is rapidly expanding and begins to blur with Caden’s real life; he ends up auditioning for someone to play himself in his own life, and then finally he ends up playing a minor character in his own story. In the meantime, peripheral characters around him are dying with increasing frequency, heightening his own morbidity. Following all of this? I thought not. There are many fine concepts and ideas at the centre of all of this: most significantly the folly of trying to make art which accurately mimics life which ends up as a kind of infintely repeating Borgesian labyrinth. Within this, other ideas are shoehorned in, sometimes as distracting asides, sometimes as comedic tonic to the bleakness of the bulk of the film. The cast, a dream ensemble of fine character actors, do their best to make an unappealing group of individuals watchable, but ultimately their best efforts get squashed underneath the weight of portent. It is a tough two-hours to sit through, and not one that I wish to do again in a hurry. Some critics have thrown out comparisons to Lynch and Fellini, but I would point out that those two directors never failed to make their films entertaining; sometimes Kaufman’s film is plain dull. 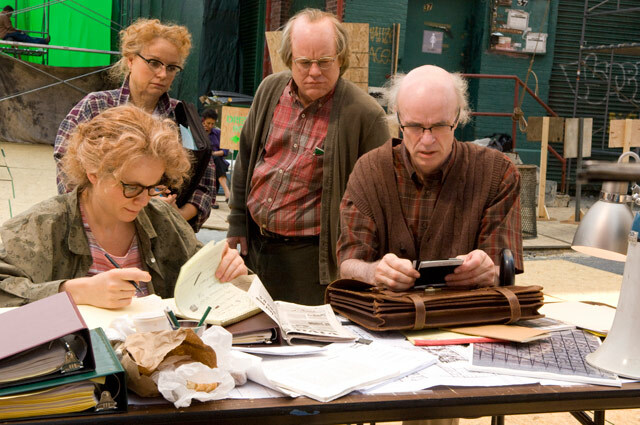 Synecdoche, New York with all of its wildly Quixotic ambition comes across as self-indulgent but not in a self-satisfied way like the terrible I Heart Huckabees (2004). Instead, there is the feeling that Kaufman is reaching for something that is just out of his grasp – but at least he is trying.